In last week’s blog, I surveyed a few of the different ways in which, historically, people have gotten the two natures of Christ wrong. Arianism denied that Christ was true God. Docetism denied that Christ was true man. Nestorianism asserted that Christ not only had two natures, but was two persons. Monophysitism said that Christ had only one nature – a composite God-man nature. All of these Christologies were declared by the Church to be heretical. So if these Christologies are wrong, then what’s right? How do we properly understand the relationship between the two natures – divine and human – in the one man, Jesus Christ? Enter the funny names. The Church has regularly used three genera (singular, genus) to describe how the two natures in the one man Jesus Christ relate to each other. Genus is a Latin word meaning “type,” or “kind.” It is regularly used in biology as a taxonomic unit. Thus, these three genera have been used by the Church to explain the types of ways in which the two natures in Christ relate to each other. Be warned, however, for these three genera have funny names. But don’t let that throw you. For they present some serious Christology. The Genus Idiomaticum seeks to uphold the distinction between the two natures of Christ by declaring that each nature in Christ “has its own peculiar essential or natural attributes, which it retains even in the union, yet without conversion or confusion…The difference of the natures [is not] abolished because of the union, but rather the property of each nature is preserved intact and takes part in forming the one person” (Martin Chemnitz, The Two Natures in Christ, 172). In other words, even though we cannot divide the two natures into two Christs, we can make distinctions between these two natures as they work together in the one Christ. A biblical example of the Genus Idiomaticum comes in Romans 1:3-4: “God’s Son, who as to his human nature was a descendant of David, but through the Spirit of holiness was declared with power to be the Son of God.” Here, Paul clearly distinguishes between the human and divine natures of Christ. On the one hand, Jesus, according to his human nature is the Son of David. On the other hand, according to his divine nature, Jesus is the Son of God. The Genus Idiomaticum says that it is acceptable and even important to make these kinds of distinctions as long as one does not divide Christ’s two natures. This genus is explained well by Martin Chemnitz: “The divine nature of Christ in itself has received nothing from the hypostatic union, but…his human nature has received and possesses innumerable supernatural gifts and qualities which are contrary to its nature and which are above every name and also above, beyond, and exceeding its own essential properties, which still, however, remain unimpaired” (The Two Natures in Christ, 244). In short, Chemnitz says that the attributes of Christ’s divine nature affect and enliven the attributes of his human nature. For example, because Jesus was God, Jesus – as both God and man – could walk on water. Or because Jesus was God, Jesus – as both God and man – could heal the sick. Or because Jesus was God, Jesus – as both God and man – could rise from the dead. Interestingly, this genus proved to be a flashpoint of contention between the Lutherans and those who were Reformed. The Lutherans properly maintained that this genus allowed Christ to be physically present with his body and blood in, with, and under the bread and wine in the Lord’s Supper. After all, because Jesus was God, Jesus – as both God and man – can be omnipresent, even in Communion. Those who were Reformed did not hold to this genus and so, at best, they asserted that only Christ’s divine nature, and not his human nature, could be present in the Sacrament. For Christ’s human nature could not be present on an altar while also being present in heaven, even as humans cannot be in two places at once. 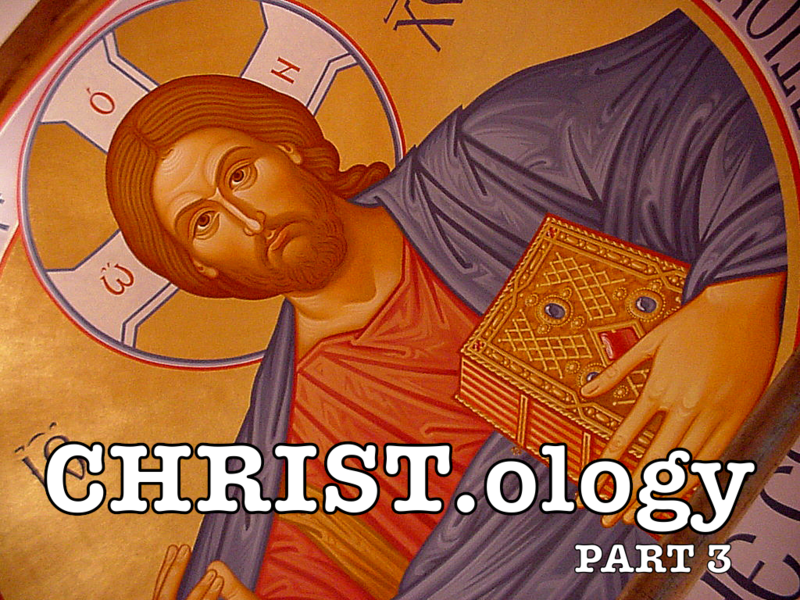 Proper Christology, then, affects many different areas in the broader discipline of theology. The Genus Apotelesmaticum asserts that even though distinctions can be made in Christ’s two natures, the whole person of Christ, and not one of his natures individually, saves us. Again, Martin Chemnitz explains: “The union of Christ’s two natures took place in order that the work of redemption, propitiation, and salvation might be accomplished in, with, and through both of His natures” (The Two Natures in Christ, 218). Thus, when we speak of our salvation, we say, “Christ saved me.” We do not say, “The human nature of Christ saved me when he died on the cross,” or, “The divine nature of Christ saved me when he rose from the dead.” No! All of Christ – his birth, his ministry, his death, and his resurrection – effects our salvation. From time to time, I will see bumper stickers on the back of vehicles with a simple two-word confession: “Jesus Saves.” Besides being a nice way in which Christians can share their faith, these bumper stickers also represent a proper understanding of the Gensus Apotelesmaticum. For they are a good reminder that it is Jesus – all of Jesus – who saves us. It is good Christology wrapped up in two words. And this is why Christology is not only incredibly intricate, it is also blessedly simple. For this confession of “Jesus saves” is a confession we can all carry in our hearts and on our tongues no matter how young or old, how theological trained or theologically novice we may be. Carry it to someone else today. Entry filed under: Christian Doctrine. Tags: Christology, Genus Apotelesmaticum, Genus Idiomaticum, Genus Majestaticum, Two Natures in Christ.